Government buses en route to evacuate the sick and injured from two government-held villages in the province of Idlib were burned by the so-called “moderate opposition” on December 18. The villages of Foah and Kefraya are encircled by a coalition of militant groups led by Jabhat Fatah al-Sham (formerly Jabhat al-Nusra, the Syrian branch of al-Qaeda). The Aleppo evacuation agreement included the demand to militants to allow people to evacuate from these villages. However, all buses sent for this were attacked and torched. The so-called “opposition” denied despite video and photo evidence confirming that its fighters were involved in the crime. Some Turkish media even suggested that “Shia militias” and “pro-Assad terrorist groups” burned the buses. The Syrian army, the National Defense Forces and Hezbollah are putting pressure on an ISIS force in the area west of Palmyra in the province of Homs. By December 18, government forces have pushed ISIS units from the areas southwest of Palmyra and secured the Tyas-Qaryatayn road. This move allowed the Syrian army and its allies to repel the threat of encirclement of the Tyas Airbase by ISIS forces. On December 19, the army and its allies continued to develop the advance in the directions of Bayt Jarbu al Azw and Baydah. Government forces allegedly use the Russian-made heavy flame-thrower system TOS-1A “Solntsepyok” against ISIS in the area. ISIS reportedly destroyed 3 battle tanks, 2 vehicles and to damage 4 battle tanks belonging to the Syrian army. Pro-government sources report that ISIS lost some 4 battle tanks and 10 fighters. Over 50 airstrikes by Syrian and Russian warplanes were reported on December 18. The US-led coalition’s airpower also delivered some 30 airstrikes against ISIS units in the area. Kurdish YPG forces have reached the Tabqa dam reservoir and encircled ISIS units in Jurniyah, al Dybh, Abdullah al-Masoud Hamidi, Bisrawi, Abu Jiddi, Msheirfet Eljerniyeh, Khabat al-Sharafat and nearby areas. The Syrian military reportedly issued a nationwide call for military reserves to return to active duty on December 18. This has been the biggest mobilization effort since the start of the Syrian war and probably since the Arab–Israeli War in 1973. 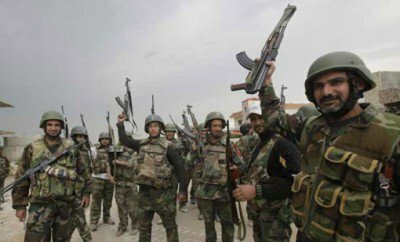 Some experts suggest that reservists will serve in security forces formed to maintain stability in the recently liberated areas as Aleppo and Western Ghouta – the move that SouthFront predicted on December 14 in an analysis of possible developments after the liberation of Aleppo. This will allow to free significant number of active soldiers for further offensive operations.